A Master Hashashim's Guild improves law and order in the region, and the quality of locally trained assassins. 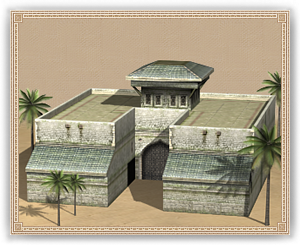 The Hashashim's Guild Headquarters improves law and order in the region, and the quality of locally trained assassins. The Hashashim are a notorious order of killers who hail from the Alborz mountains, who are infamous for their brutal efficiency at doing away with people, regardless of their station or security. When the Hashashim choose to set up a chapter house in a city, it is a true testimony to the grim cunning and determination of the young men emerging from the streets.